Maritza Miranda Saenz is running for the Arizona Senate to represent Legislative District 27, which encompasses parts of Central Phoenix and the communities of Laveen, South Mountain, and Guadalupe. She is a candidate who comes from a family with experience in both law and grassroots politics. Her mother, Lucy Lopez-Goss, served indigent clients for the Maricopa County Office of the Legal Defender, and her father, the late Rep. Ben Miranda, served the area as a legislator, attorney, and activist. It is a tradition Miranda Saenz carried on while working alongside her father for 15 years. Her involvement in the community continued as she started a small business that mentors area youth. Miranda Saenz entered the race with an interest in supporting education and small businesses in Arizona, as well as protecting our voting rights and environment. Since 2015, Miranda Saenz’s opponent, Catherine Miranda, has been the Democratic Senator for LD 27. Before that, Catherine served in the AZ House since 2011. 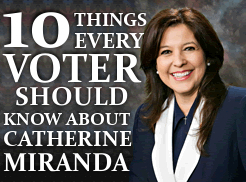 During Catherine Miranda’s Senate bid in 2014, we gave her the spotlight on this blog for a very different reason. As we wrote then, “A lot of us might assume that a female Democrat will be a fierce advocate for reproductive rights, but that’s not always a safe assumption” — and, as we summarized then, Rep. Miranda has turned that assumption on its head time and again. In her five years in the Senate, Rep. Miranda has supported legislation to ban state funding for abortion providers, restrict the administration of medication abortions, and create other new barriers to reproductive health care. 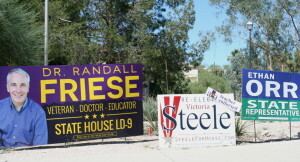 Rep. Miranda’s record earned her an “anti-choice” classification from NARAL Pro-Choice Arizona, as well as the endorsement of Arizona Right to Life. Maritza Miranda Saenz thinks the voters of LD 27 need an alternative. On July 14, she generously took the time for an interview to tell us more about her candidacy and what’s at stake in the election.